Who is Jessica Enevold Duncan? You can do Magic ????☀️?❤️!!! If I had realized I was going to paint a face, I would never have signed up! But your relaxed, lovely style made me feel safe enough to open up. It was exciting and exotic at the same time! What is important is that you allowed me to do it my way – you saw me where I was, and met me there. This is your strength, and I see you do it with the others too. You coach them from where they are. I like your set up. You inspire and you give that little extra that means so much! You made me open up channels I didn’t know I had! I have my paintings on the wall at home, and I am incredibly proud of them! Painting with you is absolutely wonderful! Dr Jess, Your Creative P.T. Hello! I am Jessica Enevold Duncan and I invite you to get real with art! 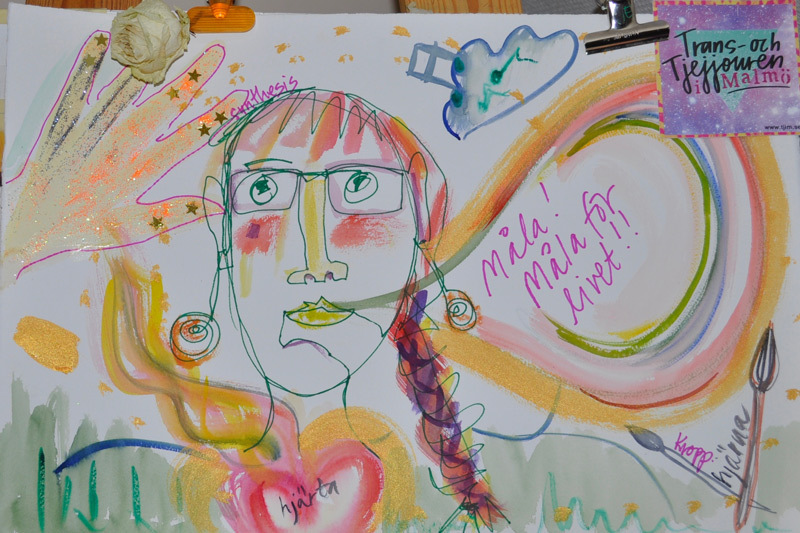 because she is the combination of my background and trainings from traditional universities that I have attended in Sweden and the US as well as the alternative academies of spirituality like Findhorn and Esalen, and various art schools, and courses I have taken. 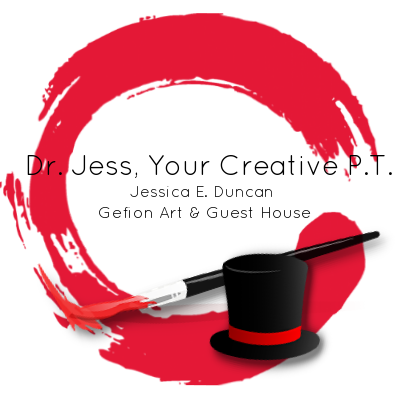 Dr. Jess is a Certified Intentional Creativity™ Teacher, & Coach, Dr. of Philosophy. Cosmic Cowgirl, Eclectic Artist, Certified Massage Therapist, Certified Physiotherapist, and Change & Educational Consultant with Rainbow Hair. She wants to share her Wonder-Woman powers with you to inspire you to find your transformational courage and wings! Please note: I teach courses both in English and Swedish. OBS: Jag håller kurser på både svenska och engelska!! Why, and who for, do I do this? When I, Dr. Jess, work with people, my aim is to guide them towards a direction and to find movement. What I do is founded on the belief that the truth shall set you (me, everybody) free, something I learned from Byron Katie. My vision is to assist you in your liberation of yourself, helping you get unstuck and setting whatever needs to move into motion. I want to help you, whether adult or teenager, to reduce the kind of suffering labelled “everyday life”, which you are often ordered to “just get over” and to open your eyes to shift your perspective, if ever so slightly. I want to assist you who are trapped by the agonies brought on by performance anxiety in school or at work, by fears of judgment, by feeling lonely, feeling ugly or unloved because of rejection or heartbreak, by a lack of self-worth, self-love or life purpose. I coach you towards liberating yourself from the negative strategy of blaming others for your fate instead of taking constructive charge and responsibility for your own feelings and actions and start creating the life you hunger for. I want to teach you to support yourself in other ways than numbing your stress and discomfort with more stimulants, love, drugs or rock’n roll… I coach you to go within to take confident action without. I have worked with people of all ages for different reasons – to find common goals, to find inner strengths, to take a step outside our conventional thinking. What is Intentional Creativity then?! 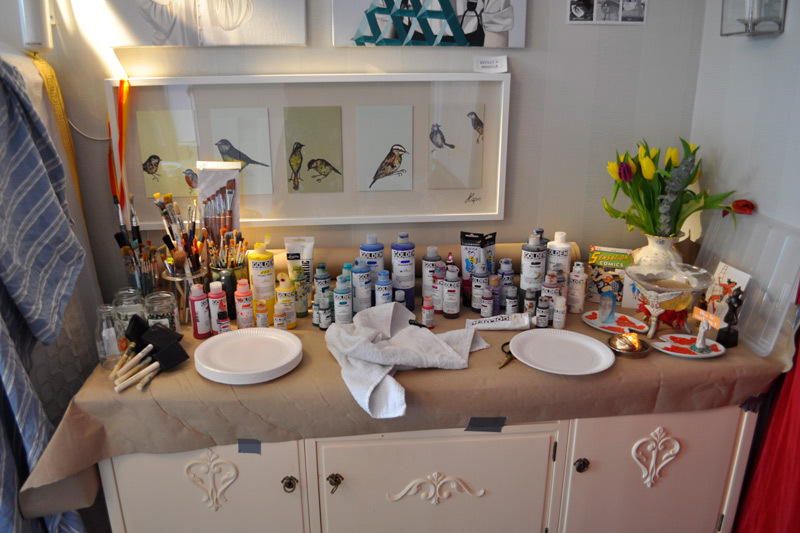 Intentional Creativity that I work with is about painting from inside, not imitating something outside of ourselves. The faces, symbols and lines we draw are from our own world of imagery, visionings, which I lead you through. Anyone can do this and most people need to do this at some point in their life. I believe that working with creativity and your thoughts is the most powerful way of setting ourselves free in an enduring way. Intentional Creativity showed me what I already knew, but made it tangible for me – form breeds new thoughts, brings clarity. I believe we are all creative and that we need creativity to nourish ourselves, call it soul if you like it or not. Whatever the form is, baking, writing, painting, building, dancing, singing, cooking or collecting coasters, we need to shape that which needs to be expressed, what we can’t say clearly or just can’t make sense of – yet. All you need to do is to want it and to show up for yourself and start transforming your thoughts into form. That is basically what we do in my workshops. We make the intangible tangible. What happens in the studio with Dr. Jess? 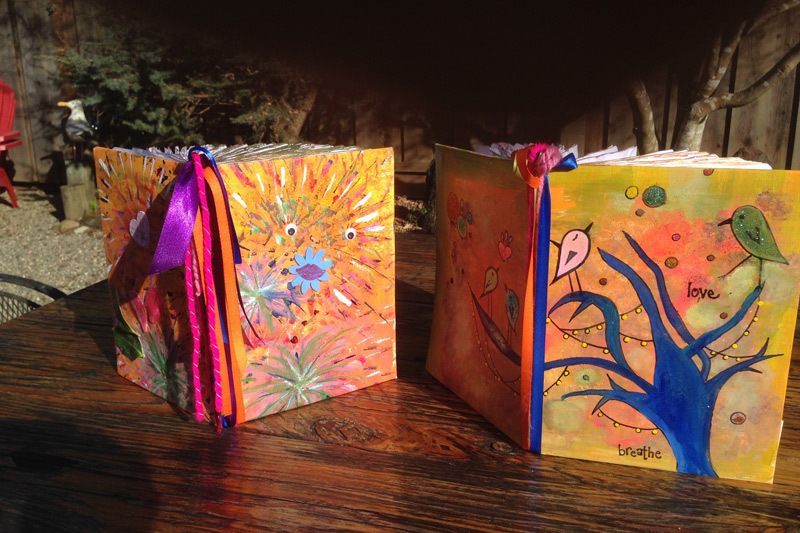 When you come to me for a workshop, I will guide you in a process of painting, inquiry and journaling, to work with a question or issue that you have. Or you can just come and be open to what emerges. I lead you in this process to assist you in arresting old stories that do not serve you and keep you stuck or to fill that blank canvas of yours with new and inspiring ones! I invite you to reignite the productive magic of the creative flow you were born with and show you a way to listen to your inner voice, so that you can make your own decisions and gather the content that you need to move in the direction of the calling, choice or goal that is in alignment with your inner fire, destiny and desire. Curious? Longing for some color and want to know when the next workshop is? Get in touch. I will update you when I have something to share. Looking foward to meeting you on your next canvas. 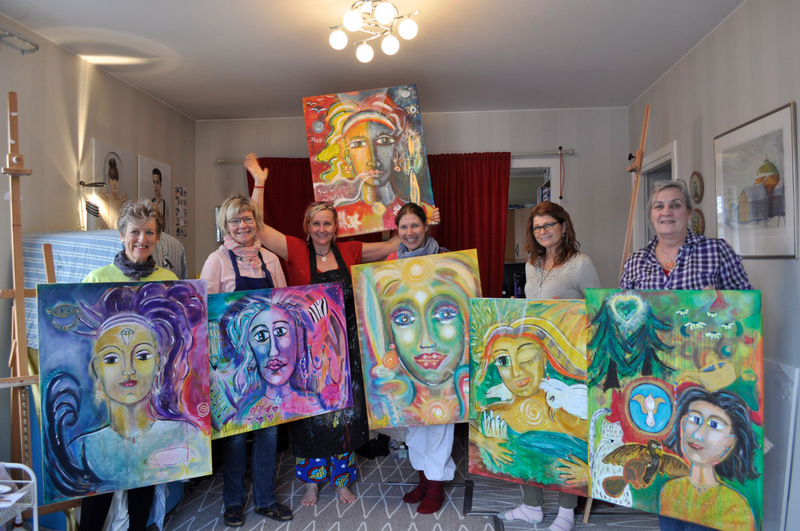 Copyright Gefion Art & Guest House 2018.